Eugene area boaters have been running this tributary of the Mckenzie for years but unfortunately it has languished in obscurity, passed over by the guides for no apparent reason. 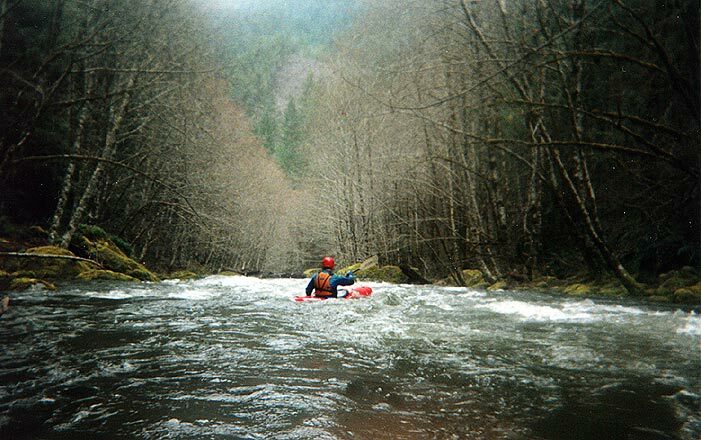 This run is definitely worth doing, and if you are an intermediate creekboater looking to hone your skills for harder runs this creek is one of the best in the valley. Others may differ, but I think Quartz Creek is really fun! We put in on a log choked bedrock ledge a hundred yards downstream of the Mile 7.5 bridge. This class IV- ledge is runnable on the far left but some overhanging branches complicate the line. 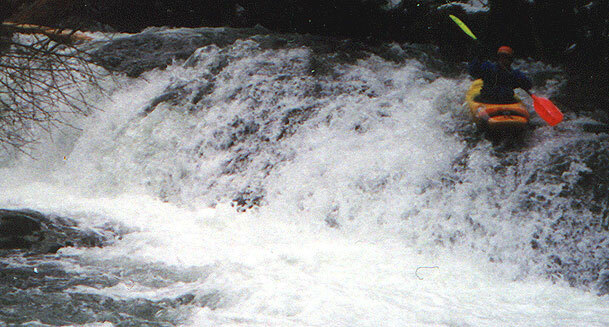 Warm up in the swirling eddy below the ledge because the continuous nature of the creek keeps paddlers occupied with plenty of fun, splashy class II-III drops. Mike Haley slides over the ledge at the put-in. It is easy to put in right below this, but we put in right at the lip instead. About a half mile downstream the creek splits around an island. The main right channel has an obvious horizon line with several vertically pinned logs and a large log forming a pour over. Run the drop far left or portage/seal launch from the island. The next 2.5 miles is mainly class 2 with an occasional class 3. After paddling under the first bridge some large boulders signal the beginning of some of larger, pushier class three rapids that continue for three quarters of a mile. After this section the creek mellows out a bit and the drops get less concentrated. The last mile contains numerous waves and holes to play in, though some can be a bit shallow. The take out is the fourth bridge over the creek. Below the take out the creek flattens out dramatically and becomes braided and log choked before finally flowing into the McKenzie below Finn Rock. Access: From Eugene, drive east on Highway 126 along the McKenzie. Turn right onto Quartz Creek road just before Finn Rock Store. Cross the McKenzie and continue up Quartz Creek Rd for two miles to where a small road takes off to the right and crosses Quartz Creek. Do not cross the bridge to park because the gate can be closed at any time- also, park far enough off the road to avoid interfering with timber company vehicles. This is private timber company land, so keep a low profile! To reach the put in, continue up Quartz Creek road 5.5 more miles until you reach a bridge over the creek (7.5 mile bridge). The road closely parallels the creek all the way up, allowing paddlers to see much of the creek. Put in on the log choked bedrock ledge a hundred yards downstream of the bridge. Hazards: The area surrounding the creek has been heavily logged, so wood is an ever-present danger. 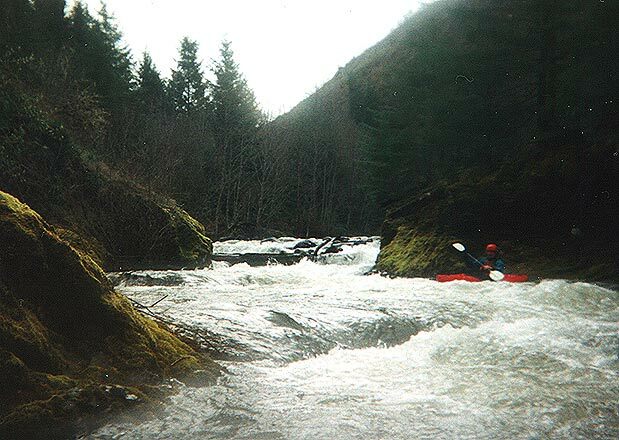 Though this section had no logjams blocking the creek channel as of January 2000, that could change at any time. Boaters should remain alert for fallen alder and other sweepers, as well as for wood protruding from shore. The general fast pace of the creek could cause problems for swimmers. Gauge: None exists, but a minimum flow seems to correlate with the SF McKenzie Gauge on Pat Welch's site at around 1500 cfs. A couple of days of heavy rain are needed.